A state of emergency has been declared on a Russian remote Arctic island following the invasion of about 50 polar bears. Russians have described the besieging of the town of Soviet nuclear testing archipelago Novaya Zemlya as terrorising. Despite the siege, residents have been warned they face prosecution if they shoot the endangered species. People are “afraid to go outside” and “daily life is in turmoil”, said deputy head of local administration, Aleksandr Minayev. The invasion has left people “fearful” and is the worst case of wild animal invasions this island has ever seen. 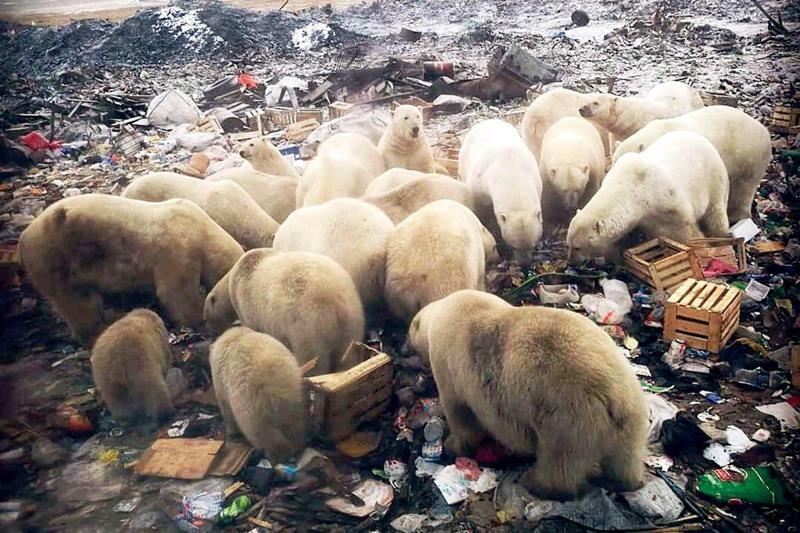 The focus is the town of Belushya Guba where 52 polar bears have been counted scavenging for food in local dumps and wandering around the settlement. Many of the residents of this bleak outpost are Russian military personnel. Despite this, some go outside even when the bears are a few feet away. The beasts have lost their fear of people, and are no longer afraid of shots being fired into the air, sounding car horns, reported The Siberian Times. The species are endangered and instead, a team of specialists has been dispatched to the outpost to give advice to residents on other measures to discourage the bears. Teachers have pleaded for security measures to protect pupils. The bears come and go but there are always at least “six or ten” prowling the apartment blocks, said Minayev. Resident Anastasia Bondarenko has moved out but she said the bears were no longer threatened by humans. She said: “There are no more enemies….they became insolent. This is scary. The town’s population is just under 2,000 people and it’s the main permanent settlement on Novaya Zemlya. The archipelago in the Arctic was used by the USSR for nuclear tests.